United’s assertive response to encroachment by familiar rival Virgin America on core markets from United’s Newark hub to Los Angeles and San Francisco does not seem to be significantly affecting the network carrier's 2Q2013 revenue performance as its current unit revenue projections are in line with those issued by its largest rival Delta. Previously United executives had warned that the new competition from Virgin America in those two key trunk Newark transcontinental markets would pressure its unit revenues for the current quarter, but the 0.3% to 1.3% rise in that metric forecast by United is roughly on par with the flat unit revenue performance forecast by Delta. After Virgin America introduced its thrice daily service from Newark to Los Angeles and San Francisco in Apr-2013, United crafted an interesting response – a huge capacity increase accompanied by undercutting the fares offered by its smaller rival. Given the new found capacity discipline and the abandonment of chasing market share by the US major carriers, United’s response to Virgin America’s market entry in Newark seems to come from an old airline playbook, which has raised some eyebrows. But after a tumultuous 2012 United’s aggressive counter offensive is somewhat understandable as it has a campaign under way to win back corporate customers who fled during operational meltdowns a year ago. Virgin America finally gained long-coveted access to Newark through slots divested by American Airlines in its bankruptcy process. The transaction is ironic given American responded aggressively to Virgin America’s entry into Dallas/Forth Worth through frequent flyer promotions in order to thwart passengers from jumping over to its younger rival. United dramatically increased capacity from Newark to Los Angles and San Francisco after Virgin America’s market entry to fortify its leading carrier status even as Virgin America presently only represents a 15% seat share in the Los Angeles market and 14% in San Francisco (based on current Innovata data for the week of 7-Jul-2013 to 13-Jul-2013). Despite its 103% increase in seats deployed between Newark and Los Angeles from 24-Mar-2013 to 7-Jul-2013 United’s seat share slipped from 86% to 79%. 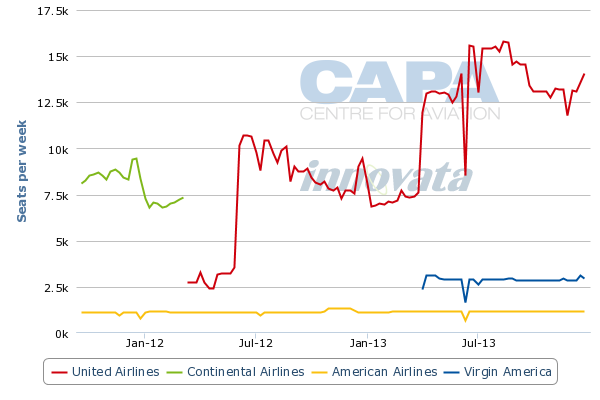 The same scenario occurred in San Francisco, where United’s 100% seat share dropped to 86% once Virgin America launched service despite a 107% increase in United’s one-way seats on offer between 24-Mar-2013 and 7-Jul-2013. During Apr-2013 United’s senior management warned that Virgin America’s market entry into Newark and the 20% undercutting of fares that accompanied its launch would negatively affect United’s 2Q2013 unit revenues. But as it was issuing those words of caution, United was gearing up for a fare battle with its rival on top of adding significant capacity in those markets. While the response – specifically the enormous capacity expansion – seems somewhat excessive, the reality is United is probably willing to absorb some losses on those key markets in order to preserve its leading position in Newark. Given its scale compared with Virgin America, it can spread out the losses triggered from a fare battle over a larger base of operations and engender some favourable passenger sentiment until pricing rationality is restored in the market. United maintains its response to Virgin America’s Newark entry is perfectly rational, noting that its lower fares will stimulate demand to absorb the capacity it has introduced in those markets. But it is highly questionable if enough demand will be generated from Newark to Los Angeles and San Francisco even though those routes are among the top destinations from Newark in terms of traffic. And while United has the benefit of some connecting passengers from its codeshare partners at its Newark hub, the incremental traffic would only put a little dent in the capacity bubble introduced by United. 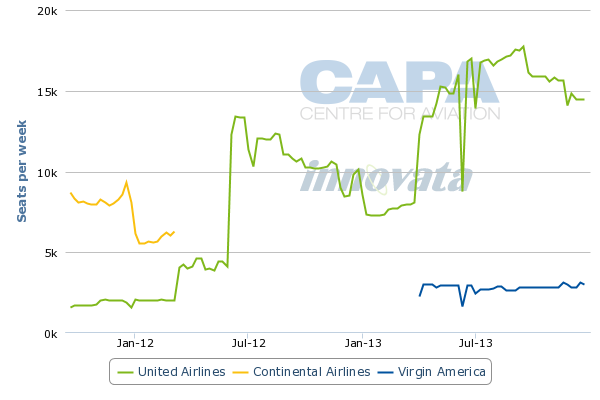 The pronounced response by United to the new competition from Virgin America could also be a by-product of its initiative to win back corporate customers frustrated by operational reliability that plagued the carrier during the busy summer high season of 2012. United did post a modest increase in corporate revenue during 2012, but admitted its performance in the business travel market fell below expectations, and the carrier has spent most of 2013 trying to win back the customers it lost during its operational meltdown. Virgin America is renowned for its product (not for its profitability) and is a regular winner of numerous customer preference awards. It has a dedicated and lower-priced first class product, which would definitely appeal to increasingly cost-conscious corporate travellers holding some lingering angst with United and more infrequent travellers welcoming another choice in Newark. American operates flights from Newark to Los Angeles, but only holds about a 6% one-way seat share, according to current schedules. Taking those factors into account, United’s decision to wage a battle on fares with Virgin America seems less surprising as United concludes there is more to lose in competing with Virgin America on two key business routes from its Newark hub, where it holds a nearly 73% share of system-wide seats deployed. Virgin America and United have competed on the JFK-Los Angeles and San Francisco markets since the younger carrier launched its first service on those routes in 2007. 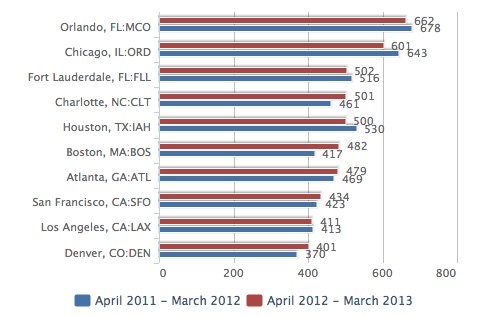 The JFK markets are more fragmented as no one carrier holds more than a 30% seat share on either of the routes. Since the competition is more spread out, the competitive dynamics are different. While price and schedule are key in any market, the JFK transcons are entering a new competitive phase as all the US major carriers are beginning to offer lie-flat seats on premium services on transcontinental flights from JFK. With the new product offerings, the fare dynamics are different in those markets than Newark. Obviously the biggest winners at the moment in the battle ensuing in Newark are consumers, who are enjoying the fallout from lower fares. But while it cannot continue sustaining losses in Newark over the long-term, Virgin America has finally realised its goal of properly serving the strategic New York metropolitan area with the Newark slots it is leasing from American, and perhaps its presence will ensure some overall lower pricing on routes long dominated by United. United has managed to bulk-up its capacity in Newark while sticking to its guidance of a system-wide reduction during 2Q2013. The carrier’s most recent estimates show overall capacity falling 2.1% for the second quarter, with domestic supply contracting 2.5% year-on-year. While the new competition in Newark and its aggressive response to Virgin America’s encroachment will create some pressure on United's 2Q2013 performance, United presently estimates a 0.3% to 1.3% rise in unit revenues for the quarter, which is close to the flat unit revenue growth projected by Delta for 2Q2013. Both carriers are recording less favourable unit revenue results than for the year prior – United’s 2Q2012 unit revenues grew roughly 2.3% while Delta recorded an 8% rise. While some of the degradation in United’s performance is likely attributable to the strategy being applied on Newark transcons, both Delta and United are likely also feeling the effects of US budget cuts and some overall softening of demand as the state of the overall macroeconomic environment remains tenuous. It is not clear how long United can or will sustain the marked capacity increases it has introduced in Newark, but its Jun-2013 unit revenue increase of 3.5% to 4.5% was its best performance of 2Q2013 (both Apr-2013 and May-2013 were both flat to down 1%) while domestic load factor in Jun-2013 grew to 88.5%. For the moment United seems to be absorbing the wild increase in supply it opted to introduce to guard its fortress in Newark. But loss-making Virgin America is not likely to back down in the fare battle any time soon, perhaps reasoning expanding its perpetual losses to solidify its position in Newark is worth diving deeper into the red.